This initiative is undertaken by the Legislators as the “100 Deadliest Days for Teen Drivers” are approaching. Including Memorial Day, May is the time for proms, graduation parties and the onset of summer vacation. Unfortunately, it is also the time when tragedy strikes and families are forced to cope with the death of a teenager in a car accident. 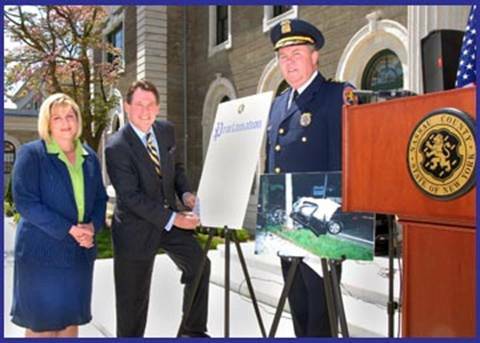 Pictured: Inez Birbiglia Chairman of the Allstate Foundation, Legislator Francis X. Becker, Jr., signing the Proclamation, and NC PD Patrol Chief William McHale.